The San Xavier Indian Reservation (O’odham: Wa:k) is an Indian reservation of the Tohono O’odham Nation located near Tucson, Arizona, in the Sonoran Desert.The San Xavier Reservation lies in the southwestern part of the Tucson metropolitan area and consists of 111.543 sq mi (288.895 km²) of land area, about 2.5 percent of the Tohono O’odham Nation. 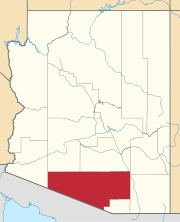 It had a 2000 census resident population of 2,053 persons, or 19 percent of the Tohono O’odham population. The Mission at the San Xavier Indian Reservation. August 2005. The reservation is home to a Spanish mission, Mission San Xavier del Bac, which was built in between 1783 and 1797. It is a National Historic Landmark, and has been in continuous use for over 200 years. It was built by Tohono O’odham laborers. Inside the casino at the San Xavier Indian Reservation. August 2005. The tribe also operates three casinos, two of which are on the San Xavier section of the reservation. The casino facilities, known as the Desert Diamond and Golden Ha:ṣañ, feature slot machines, table games, video blackjack and other forms of gambling. There is also a buffet. The facility also features a theater for live entertainment. This casino is located at the extreme western end of the main reservation (formerly known as the Papago Indian Reservation). This page was last edited on 30 July 2018, at 01:36 (UTC).